Teoria — The vertebral artery is a perfect means for a LARGER discussion of the vascular arrangement which touches upon the ENTIRE body! How’s that for a bigger theme? Just a bit of theory, thereously. For the sake of argument, consider the arterial system of the body as a grid. The vessels with transverse (axial plane) orientation are called “segmental”, and correspond to metameric segments which consist of the totality of meso-ecto-endodermal elements. For example, each dermatome is a cutaneous portion of the overall segment. For those of you who remember your school biology, think of homeobox genes and worms, which are basically stacks of segments. The human body is fundamentally similar — each vertebra, its corresponding nerve root, etc. is a segment. 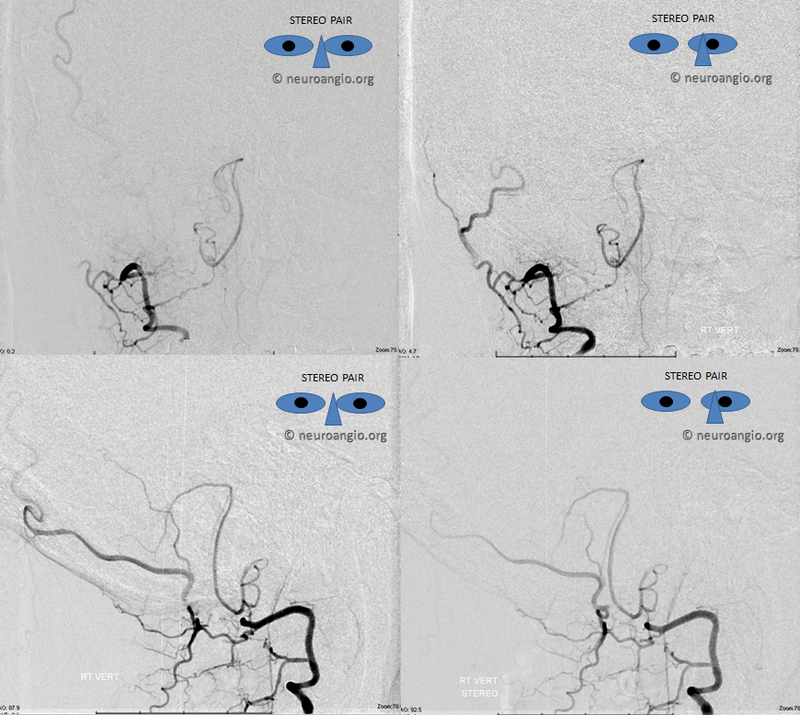 Thus, for the T9 level, there is a T9 segmental artery, intercostal artery, etc. Now, all of these transverse arteries are connected, in the early life, by paired longitudinal channels — the dorsal and ventral aortae (stay with me here). As the embryo grows, additional longitudinal channels develop to more effectively supply the needs tissues farther away from the aortae. In the mature form, the body is a lattice of transverse and longitudinal vessels. Of course, nature abhors straight lines, and so all our arteries are forever twisted and obliqued in every direction. Don’t let the living maze obscure the structured elegance of the blueprint! This is music — a finished masterpiece, comprised of structure, form, and improvisation. The vertebrobasilar system is a perfect example of this concept. The cervical spine, consisting of C1 through C7 vertebrae, and occipital bone, and their associated nervous, muscular, vascular, and cutaneous elements, are the segments. 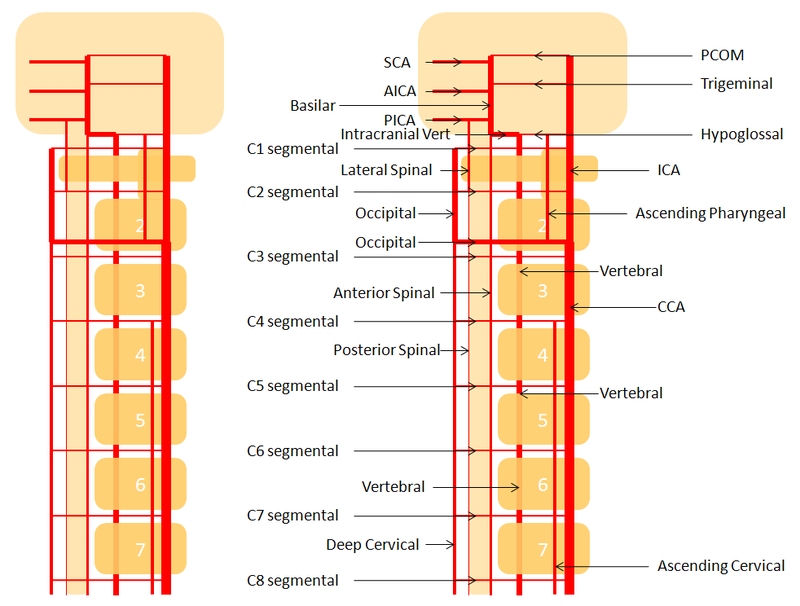 Each level is served by a segmental artery — C1 segmental, C2 segmental, etc. These vessels are united by a group of longitudinal arteries — common, internal carotid, occipital, ascending pharyngeal, ascending cervical, deep cervical, anterior spinal, posterior/lateral spinal arteries — all of these are essentially homologous longitudinal anastomotic channels between the aformentioned segmentals. From this point of view, the myriad variations observed within the system become understandable and, moreover, predictable. For the particular case of cervical vertebral artery, the neighboring homologous channels are ascending cervical, deep cervical, occipital, and ascending pharyngeal arteries, as well as the supreme intercostal artery from the thoracic aorta. 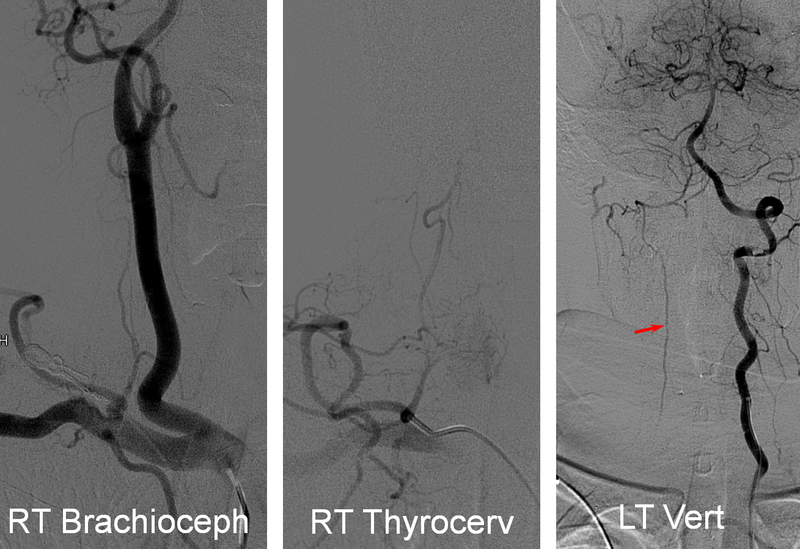 The practical implications are immediate — vertebrao artery dysfunction, whether congenital or acquired, is most likely to be remedied via trasverse segmental anastomoses with the above vessels — occipial artery at C1 and C2, deep cervical (typically) at C3-4, ascending cervical (typicall) at C5-7, ascending pharyngeal at C3 and, intracranially, via the hypoglossal branch. The following diagram serves to illustrate this concept. As the section develops, angiographic and other anatomical views will serve as living proofs to the power of the lattice theory. Embryology — the intracranial vertebrobasilar system develops after the internal carotid system is already well established — probably as demand for nourishment by the enlarging telencephalon begins to exhaust the reserve of the internal carotid system. A number of segmental, — i.e. metameric, — vessels arising from the dorsal aortae supply endo-, ecto-, and mesodermal elements and support the developing neural tube. Subsequently, longitudinal anastomoses between these vessels give rise to the vertebral artery, which eventually assumes a role in cerebral supply. Because of its segmental nature, the vertebral artery is prone to many variations, including fenestrations and duplications. Adjacent longitudinal systems — ascending and deep cervical arteries — keep extensive anastomoses with the vertebral system as part of the same segmental arrangement — and often reconstitute the vertebrobasilar system in setting of disease. For dedicated discussion (recommended), see Neurovascular Evolution and Vascular Neuroembryology sections. 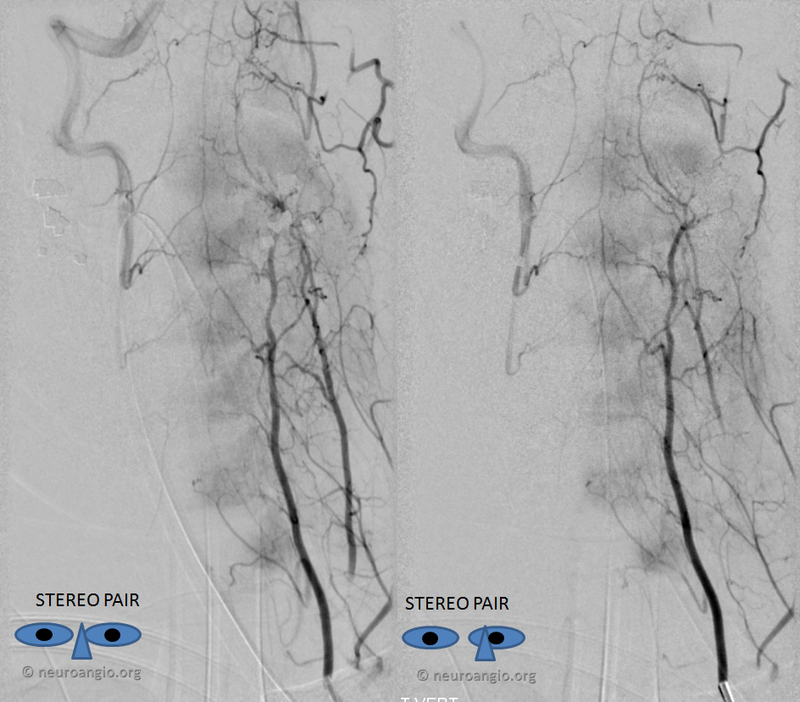 Cross-Sectional Anatomy: For a full set of CT angiographic images (vert and other vessels), consult CT Angio Vascular Atlas section. Typical anatomy — in its most common disposition, both vertebral arteries arise as the first branches of the subclavian artery, and after a short soft tissue course enter the C6 neural foramen. They then ascends to C2, make a wide loop between C2 and C1 (thereby allowing for the curious to turn their necks every which way, and for some of us to dissect our vert in the same location, — as this segment, presumably due to turning motion, is where dissections usually happen) and finally enter the cranium via the foramen magnum. The two vertebral arteries then fuse into the basilar artery, usually at the level of the pontomedullary junction. While this fairy tale does bear some resemblance with reality, the actual anatomical dispositions are often quite varied, and therefore quite instructive. It is widely taught that small caliver of an osseous foramen implies small size of foraminal contents. Lack of foramen spinosum, for example, implies an alternative course of the middle meningeal artery. The size of vertebral foramen is often taken to reflect on the size of the vertebral artery it contains, which helps in deciding whether a given vertebral artery is developmentally or pathologically reduced in caliber — small vert within a small foramen implies developmental hypoplasia, whereas the same size vert in a comparatively larger foramen suggests pathology, such as dissection, demand-related atrophy, etc. It is wise to be cautious about such conclusions. 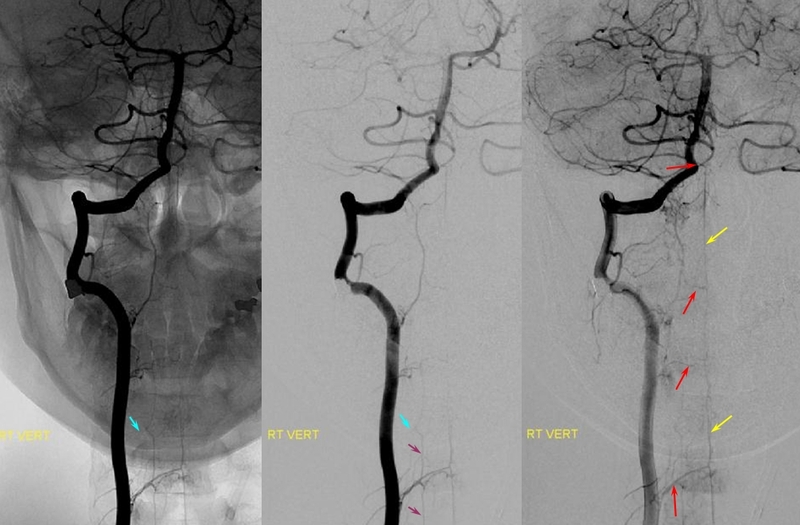 Should you undertake upon yourself to check this statement by correlating sizes of vert foramina with the artery itself, the conclusions may not be so clear-cut. 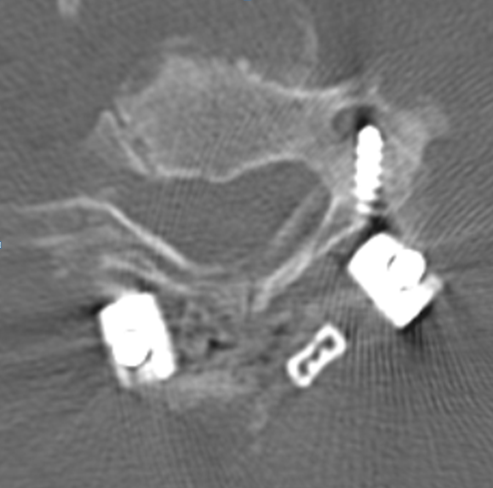 To illustrate this, a patient was noted on a post-cervical fusion CT scan to harbor the left C6 screw within the corresponding vertebral foramen. There was no indication of vertebral injury during screw placement, nor any clinical postoperative change. 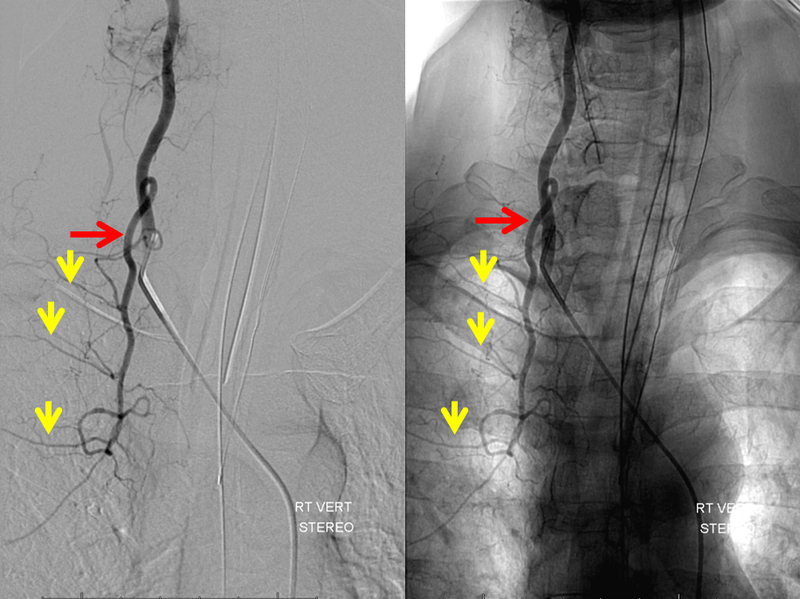 An angiogram was performed, demonstrating extra-osseuous course of the relatively smaller left vertebral artery, entering the foramen at C3 level (red arrows, where it narrowly escapes the tender attentions of the C3 screw), and well above the ultimately inoffensive left C6 screw (yellow arrows). The right vert was “normal in caliber and course”, as they say. So why the “large” C6 foramen — not sure. Besides the artery, the foramen also contains the venous plexus, but it is not a seprate chanel, surrounding rather than paralelling the course of the vertebral artery, so I don’t think it would be responsible for ossifying it the way it did. 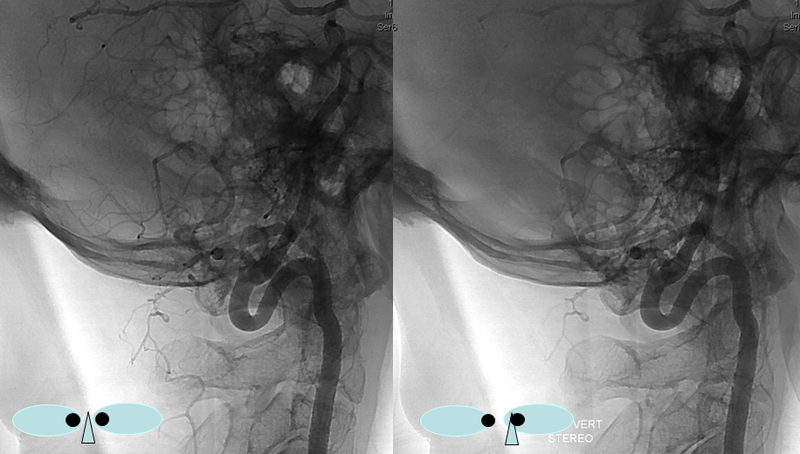 Vertebral Artery loop — these are quite common, and can protrude into the neural foramen, as is the case here. Thankfully, this phenomenon has so far largely escaped attention of the more imaginative hunters for cervical radiculopathy. A must see for practitioners of nerve root injections. Direct origin vert and vert tortuosity. Direct origin vert is marked with red arrows. Notice also marked tortuosity of the both vertebral arteries (right marked wtih yellow arrows). Bone fragment post-processing remnants demonsrate extra-foraminal location of the tortuous loops, which project medially with respect to the intraforaminal segments — and therefore are located within the neural foramina (see vertebral artery page for more images). Premature opacification of the left perivertebral venous plexus (blue arows) and jugular vein reflects an underlying cervical vertebral fistula. 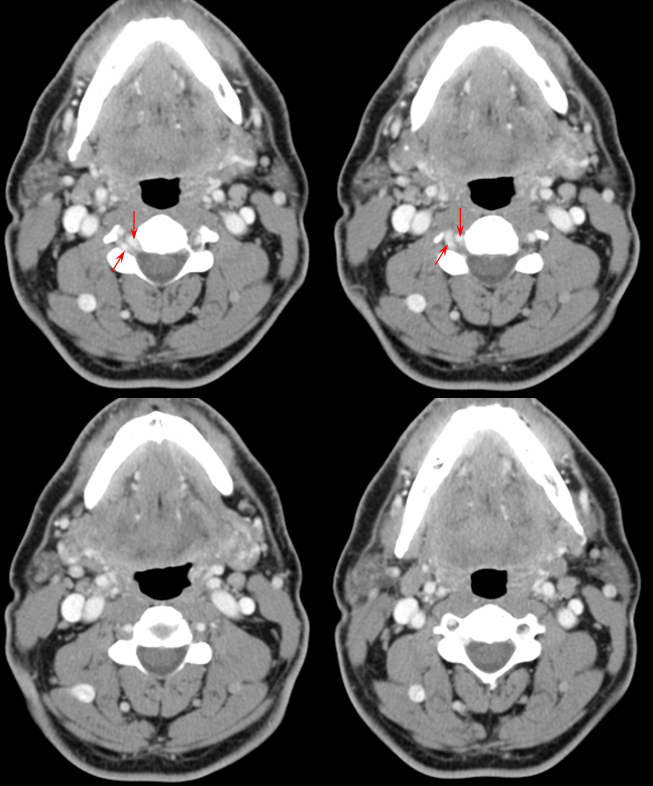 Same patient as above MIP CTA images. 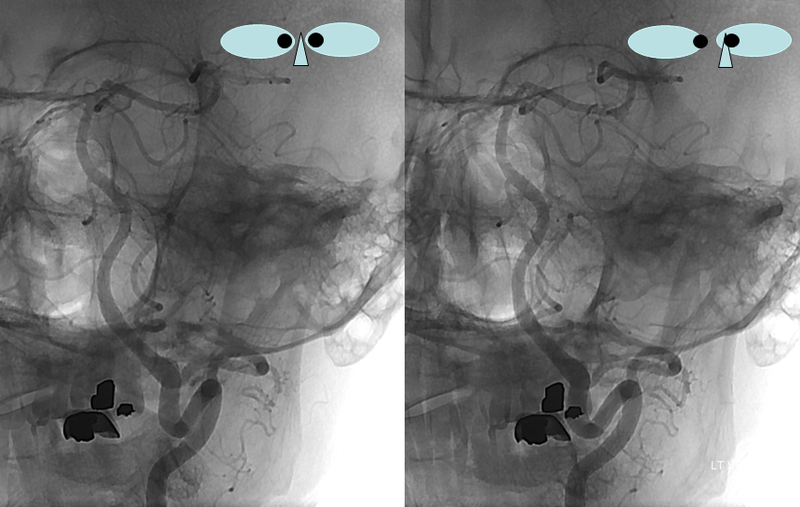 Left vertebral artery loop projects into the neural foramen (patient had no radicular pain or other deficit). On the right, extreme tortuousity results in “three” verts seen on the same slice. 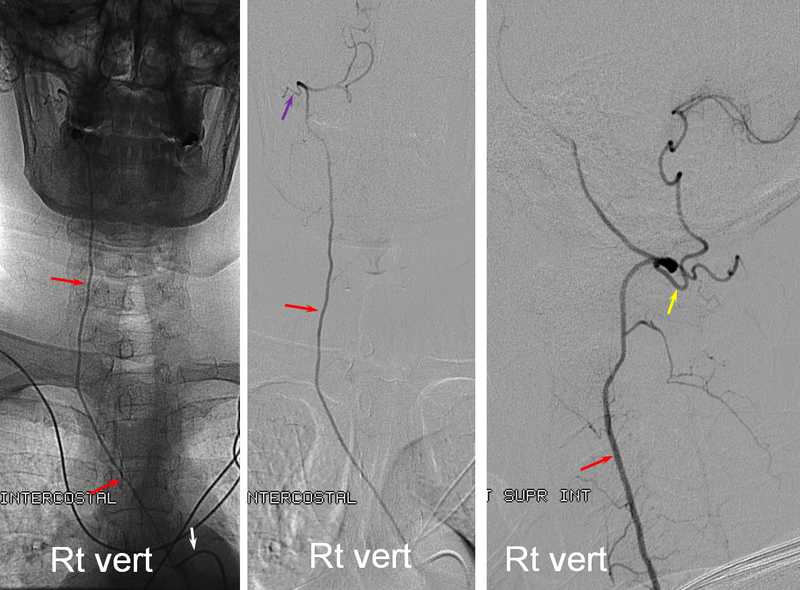 Notice dependent contrast layering (purple arrow) with unopacified and less dense blood (violet arrow) within the right IJ, draining a more rostral vertebral fistula. 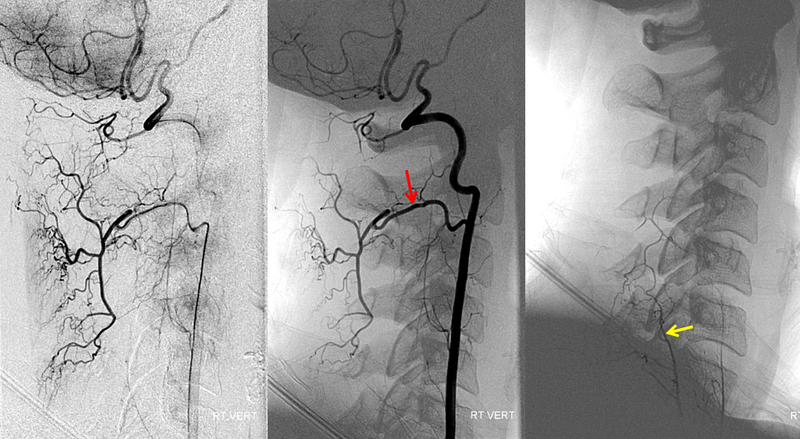 Much less common than left vert from the aortic artch (which is really quite often seen) is unusual right vertebral artery origin. 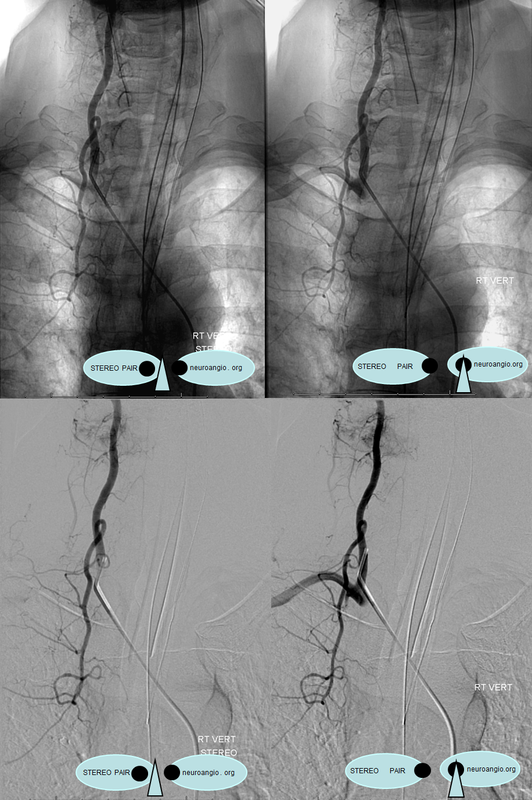 This patient was referred for angiography following inconclusive cross-sectional imaging looking for right vert dissection (clinical presenation was right-sided Wallenberg). 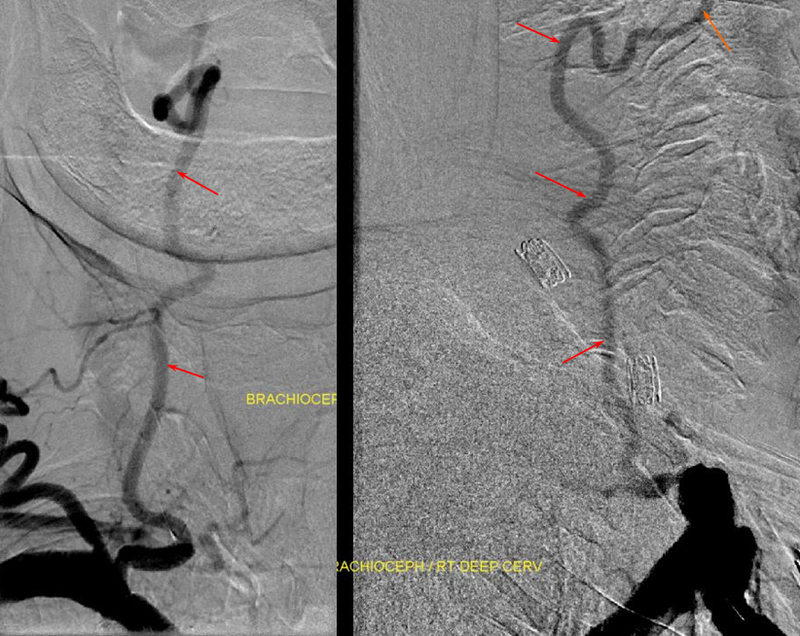 Injection of the right brachiocephalic artery shows neither vertebral artery nor its stump, to suggest proximal occlusion. No reconstitution of the vert is seen from deep/ascending cervical injections or from the right occipital, as would always be the case with proximal occlusion. 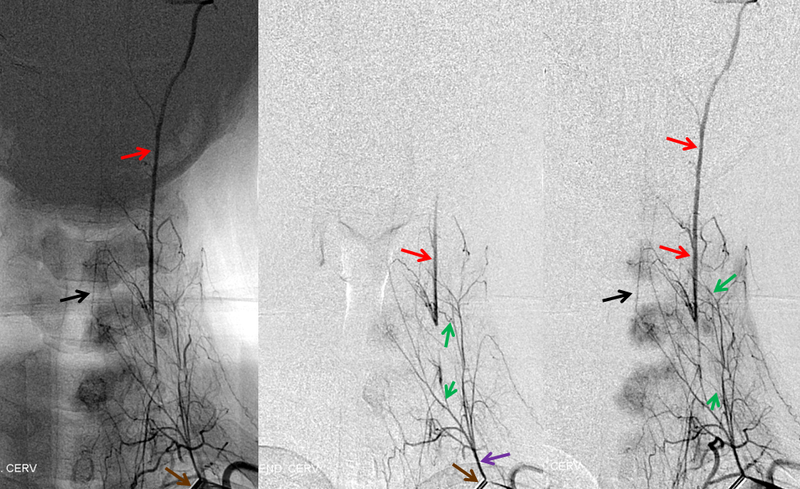 Injection of the left vert however shows transient opacification of a reasonable size right vertebral artery (red arrow), with quick subsequent washout (notice that right PICA seems normal). Where is the right vert? Supreme intercostal, as can be seen below! 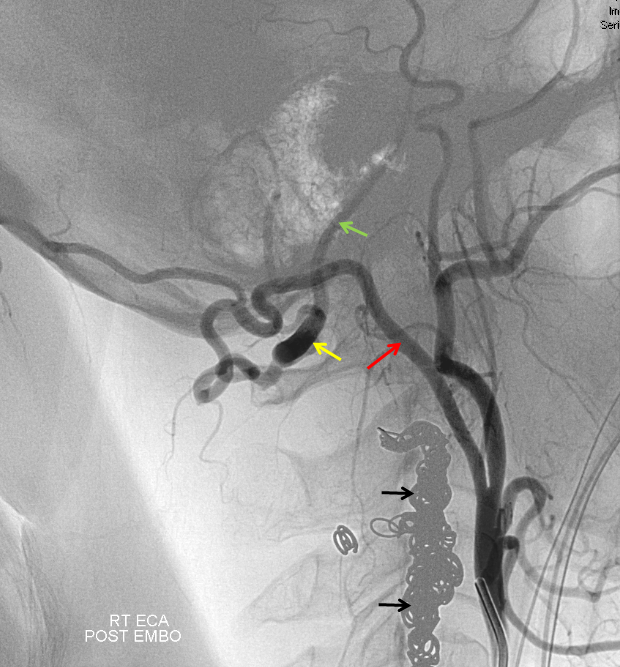 (again, the right PICA [yellow arrow] is fine at C1 origin; which means that medullary perforators to the lateral medulla likely arise directly from the vert. No dissection for sure, but cinically still a Wallenberg, likely due to focal small vessel disease). This disposition of the vertebral artery underscores its homology with other longitudinal vessels, particularly the paravertebral anastomotic network which makes up part of the supreme intercostal and plays and important role in collateral reconstitution of adjacent segmental spinal arteries (see Spinal Arterial Anatomy section). In other words, the vertebral artery, supreme intercostal artery, and paraspinal network are all homologous vessels. Homologous relationships between various longitudinal arteries, as detailed in the Spinal Arterial Anatomy section. Fenestrations — not uncommon, and usually of no clinical signficance. May attest to metameric nature of vertebral system evolving from longitudinal neural channels into a (usually) single vessel. Osseous signature of anastomosis — Here, there is a second foramen seen on the right posterior to that of the Vert. 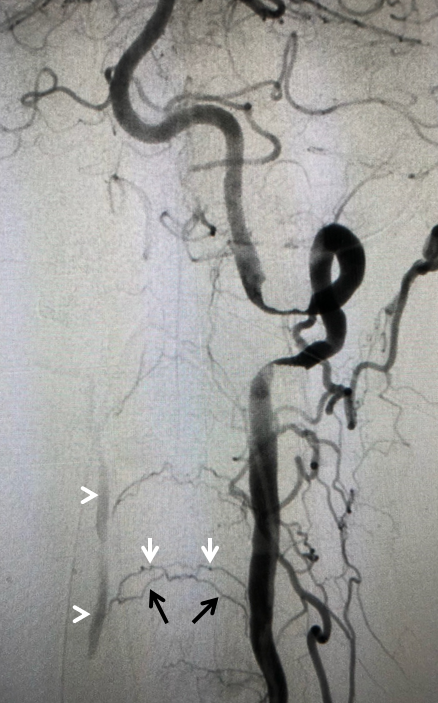 It usually cotains a branch of the ascending cervical artery on the way to join the vert, as in the angiographic depiction above, some other arterial branch, or vert duplication. 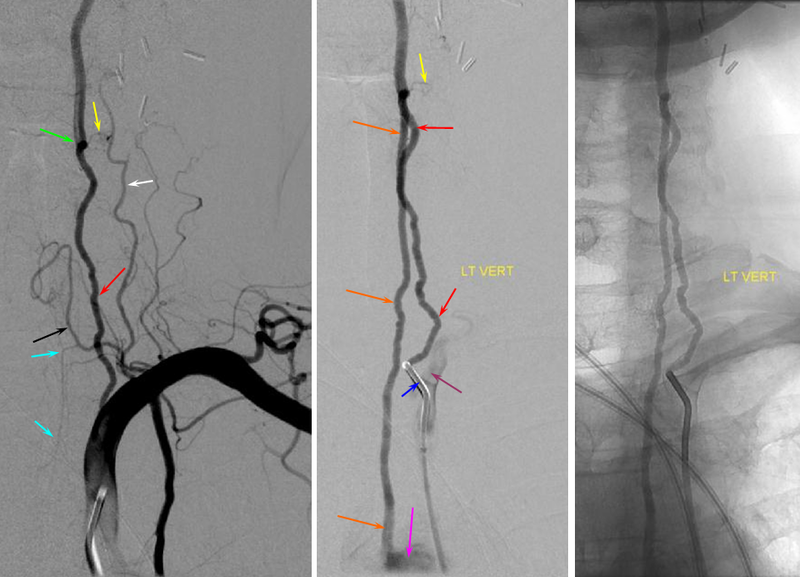 It is more common for vertebral arteries to be asymmeteric than not. More than half the time, the left one is larger, as is the case here. Looking at size of foramen can be very useful in deciphering between normal asymmetry and disease, such as dissection. 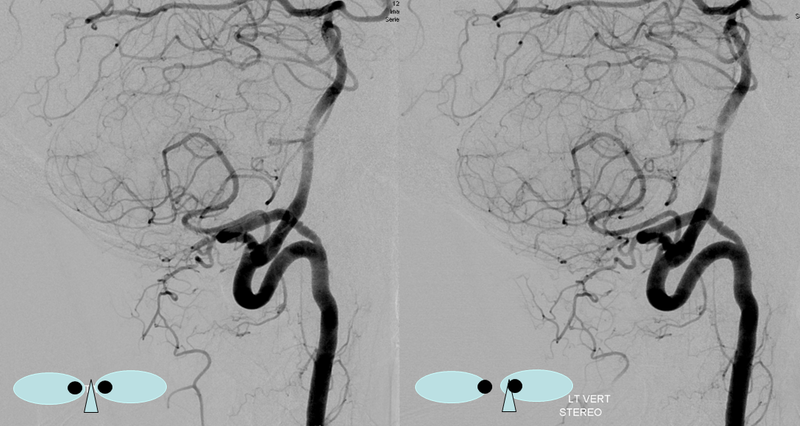 CTA curved reformatted image of a hypoplastic basilar artery which effectively (though never completely) peters out before reaching the contralateral vert. Extensive vert anastomoses may be present with ascending cervical, deep cervical, ascending pharyngeal, contralateral vertebral, occipital, and basically any other artery imaginable in the neck. The anastomotic channels are formed by trasverse segmental arteries at each of the cervical levels. The anastomotic artery varies depending on the level. For C1 and C2, it is usually occipital. C3, 4, 5 is often deep cervical, and C5/ 7 ascending cervical. 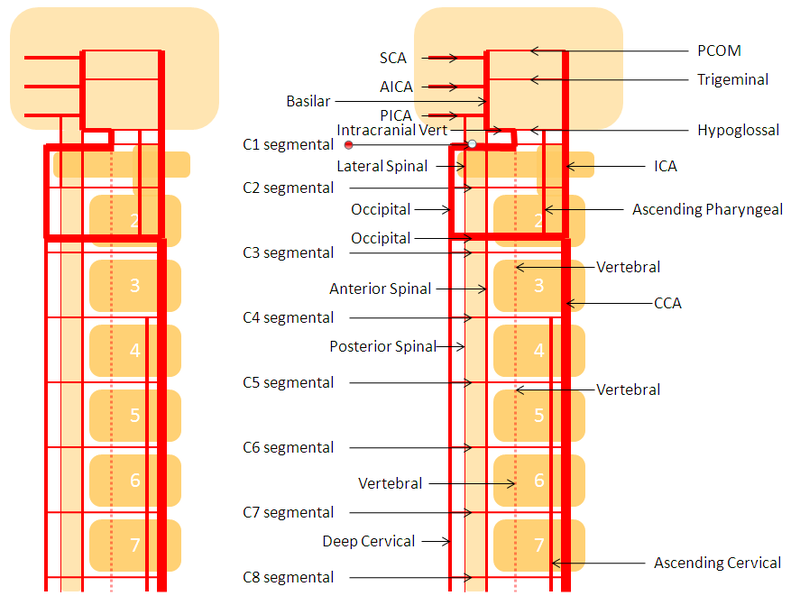 C3 is the level of the odontoid arcade, which connects both verts and thus represents a vertebrovertebral anastomosis below the VB junction. C3 and higher are also levels of potential ascending pharyngeal collateralization (see Ascending Pharyngeal Artery page also). The myriad vertebral anastomotic possibilities must be kept in mind during embolizations. Vert-deep cervical anastomosis. 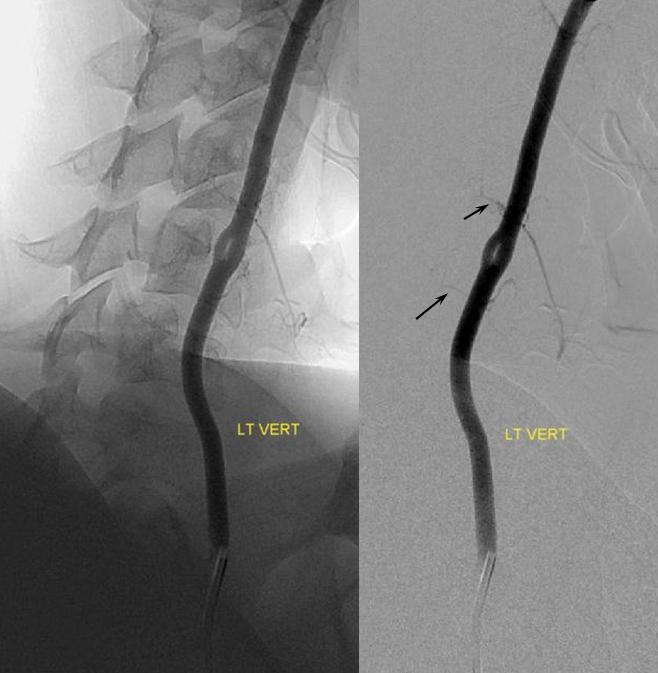 In this case of vert origin dissection, the ascending cervical artery (from the thyrocervical trunk) took over the deep cervical territory (no identifiable costocervial trunk on the subclavian injection). 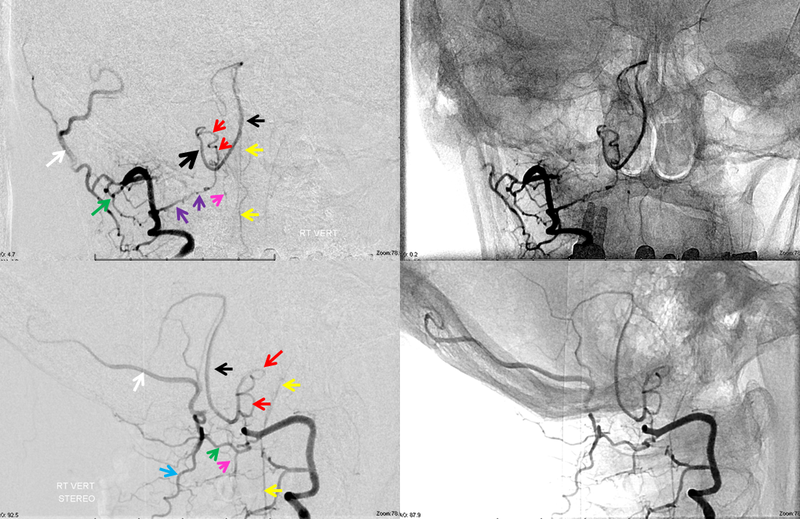 Several segmental anastomoses are present with robust reconstitution of the vertebral artery. 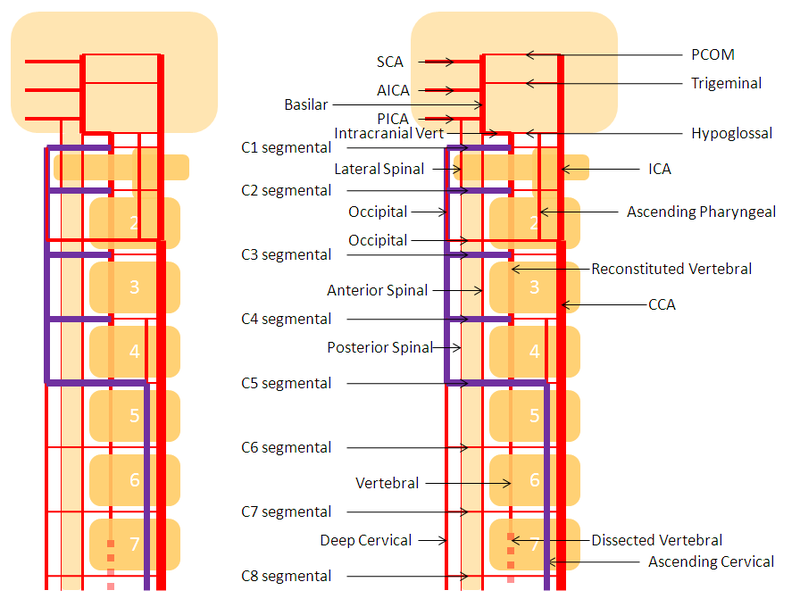 Deep Cervical Vert reconstitution — common pathway of vertebral artery reconstitution. Occipital artery often does the same. 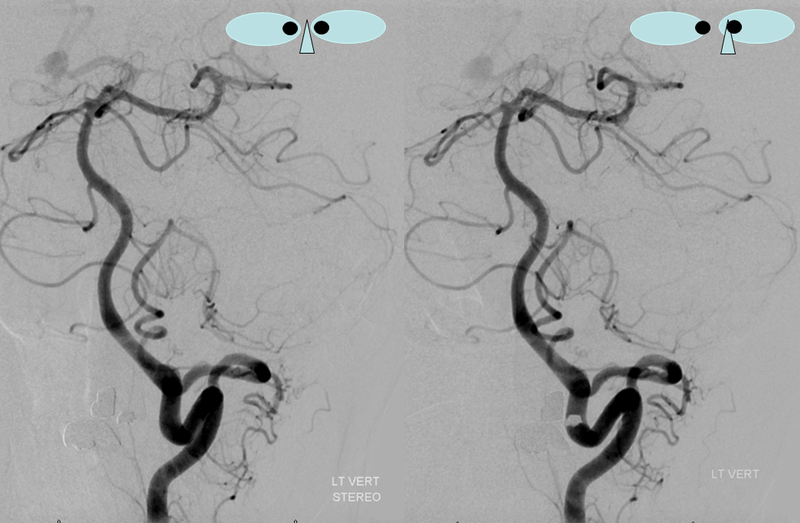 Diagram of the same disposition, with occluded vert dashed in, and deep cervical reconstitution via the C3 segmental artery. 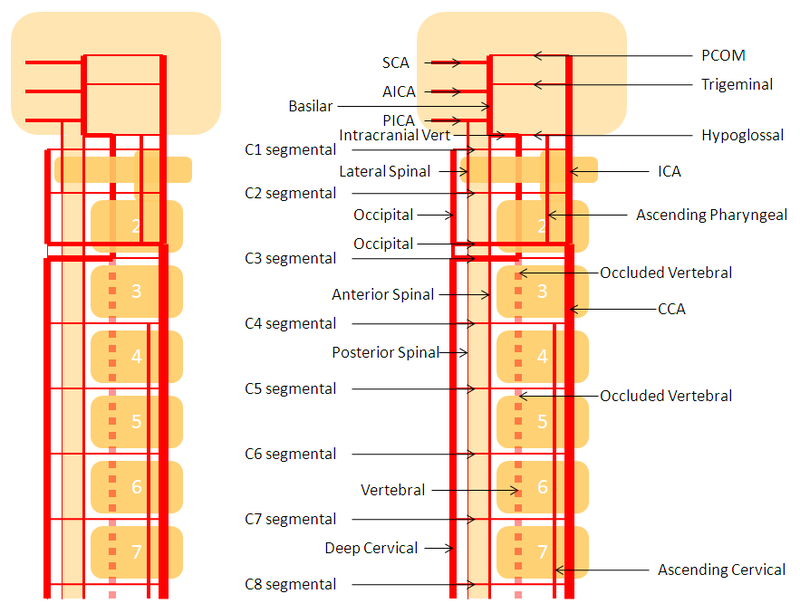 The muscular elements of vertebral artery are in hemodynamic balance with occipital, deep cervical, and ascending cervical arteries, via segmental branches corresponding to each metameric level. So, for example, the C1 branch of vert is in balance with occipital; C2-5 usually with deep cervical, and C5-7 with ascending cervical. In the same way as deep cervical can reconstitute the vert, so can vert dominate deep cervical muscular territory. Left and center lateral projection views of right vertebral artery injection demonstrate dominant posterior cervical musculocutaneous elements supplied via the C3 segmental branch (red). 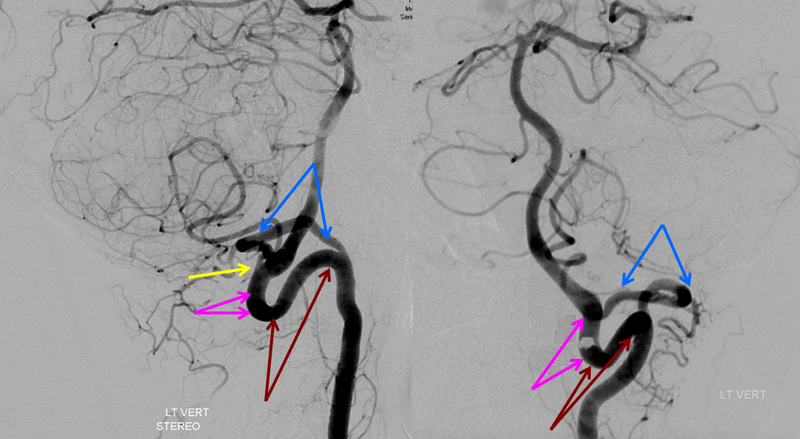 Ipsilateral deep cervical artery is hypoplastic (yellow). 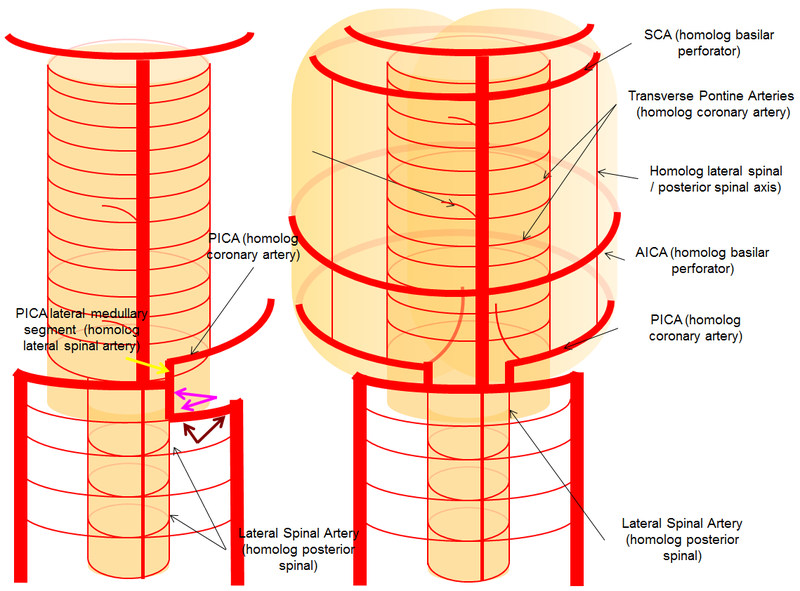 Diagram of the above arrangement, demonstrating a hypoplastic deep cervical artery, whose territory has been supplied via the C3 segmental artery. 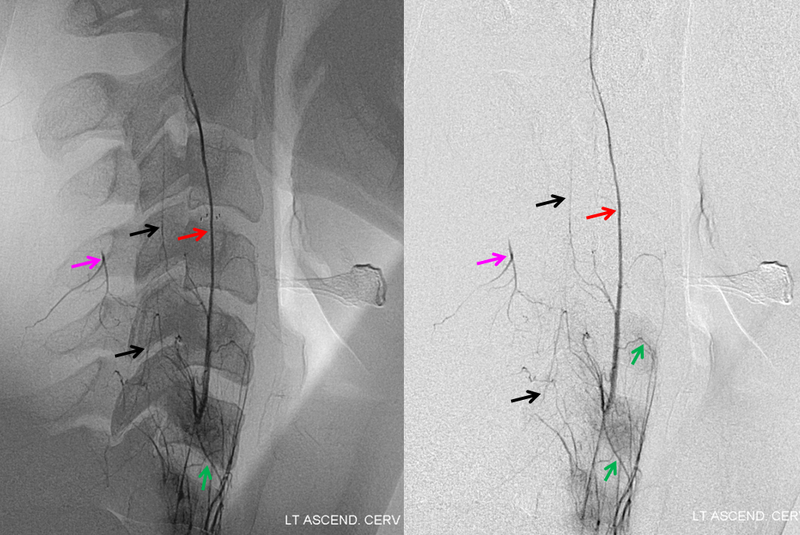 Selective ascending cervical artery (purple) injection frontal views above and lateral views below (catheter brown arrow), demonstrating C6 and C7 level segmental artery (green) anastomoses with the vertebral artery (red). The anterior spinal artery (black) is opacified via the vert. 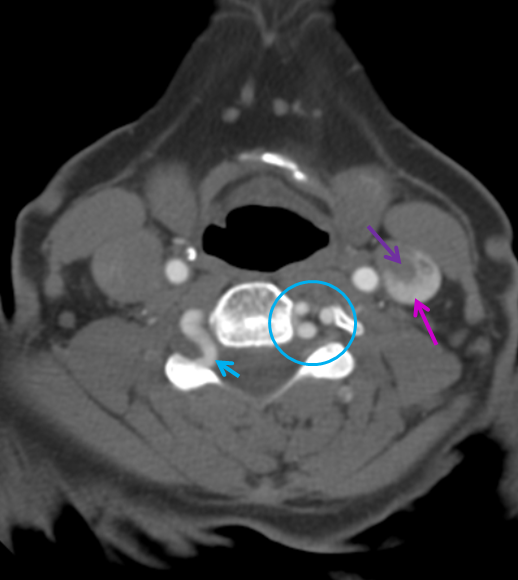 Transient opacification of the deep cervical is seen also (pink). Selective injection allows for visualization of anastomotic channels by pushing contrast through the ascending pharyngeal vascular bed until to opacify the vert. 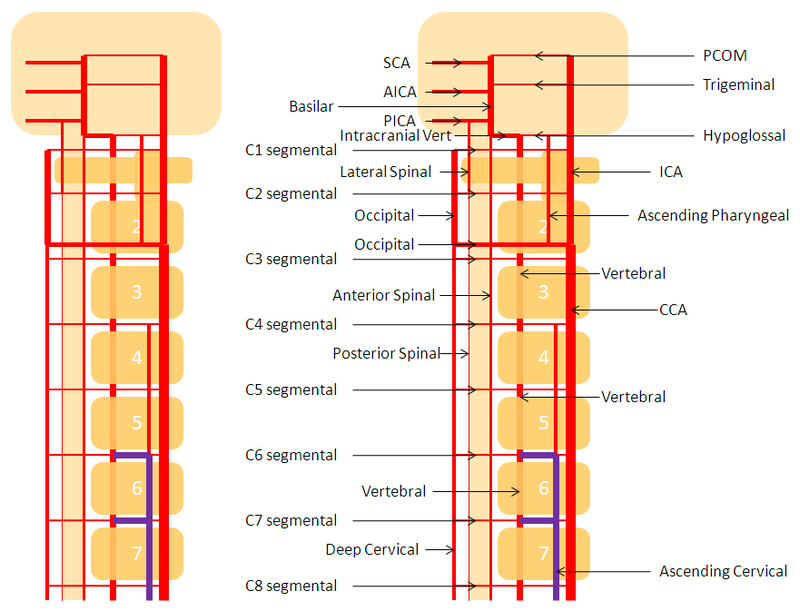 Diagram of above disposition, with purple vessels outlining the anterior cervical-vertebral anastomoses. 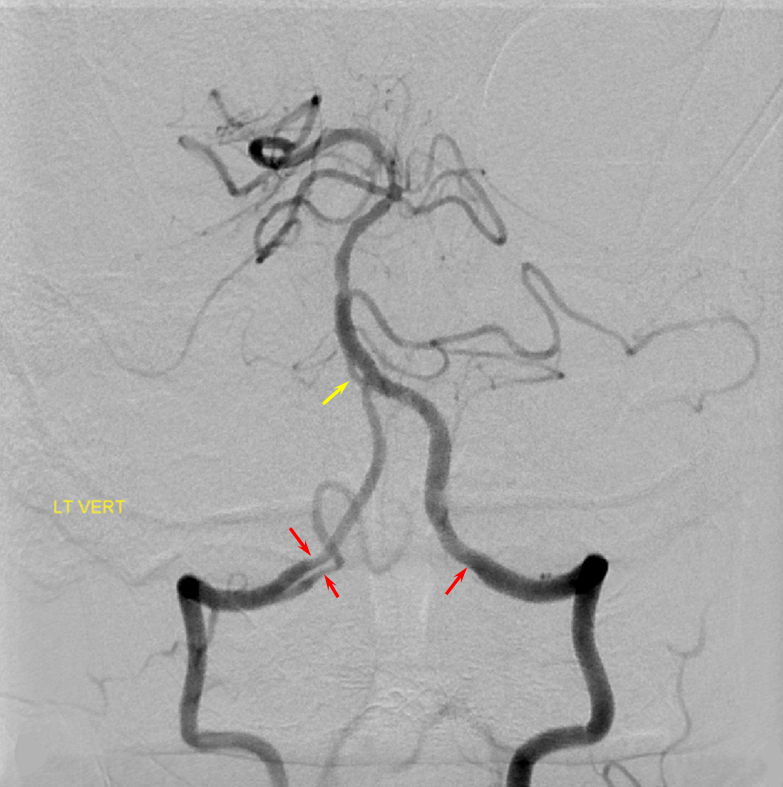 The occipital artery (red) is visualized through the C1 branch (yellow) of the vert. The same segments of the occipital are labeled in red on both injections. Occasionally, the distal occipital artery arises predominantly from the vert. Its mastoid and auricular territories are then subsumed by other arteries. The two vertebral arteries may be well-connected via the artery of the odontoid arcade, which arises from the C3 segment and passes over the odontoid to the contralateral C3 vertebral segment. 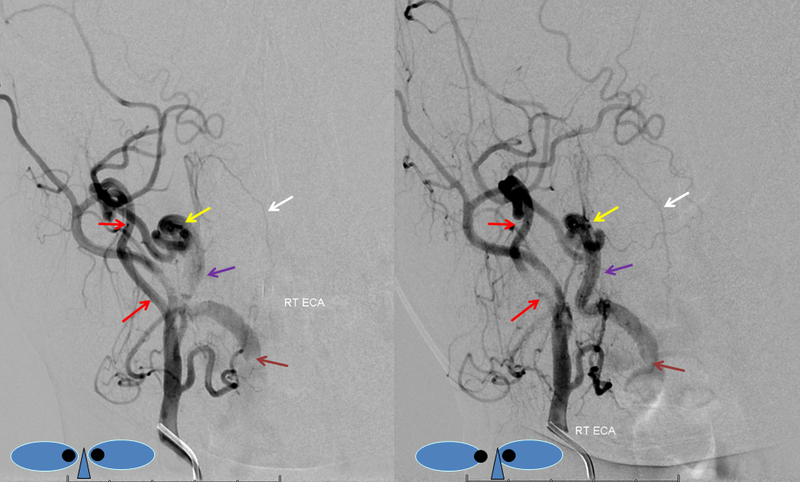 This is well-illustrated in a case of right vertebral artery ostium occlusion, with reconstitution of the same at C3 segment (brown) via the odontoid arch (red. apex at odontoid level marked in blue) from the contralateral left vert (yellow). 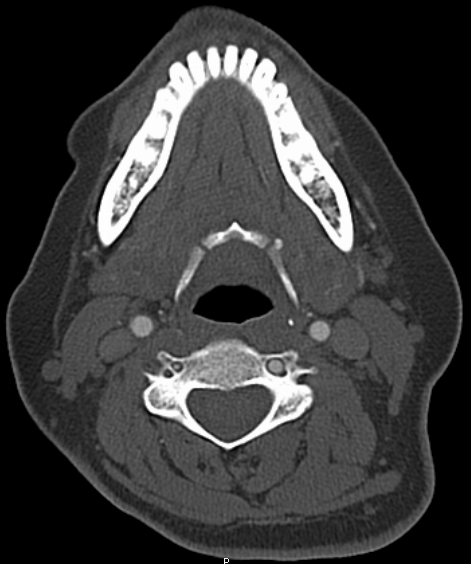 Additional deep cervical anastomoses, present in this case, are not shown. 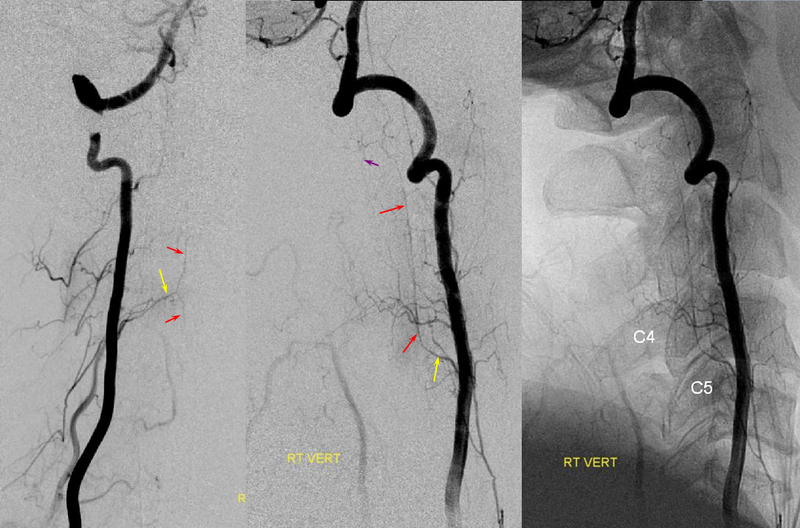 Any embolization in the vertebral territory must be preceeded by careful search for the anterior spinal artery, which most commonly arises from one of the verts. Vertebral artery sacrifice must likewise be done in a fashion that preseves sufficient runoff into musculospinal or other branches to allow for continued patency of the anterior spinal system. 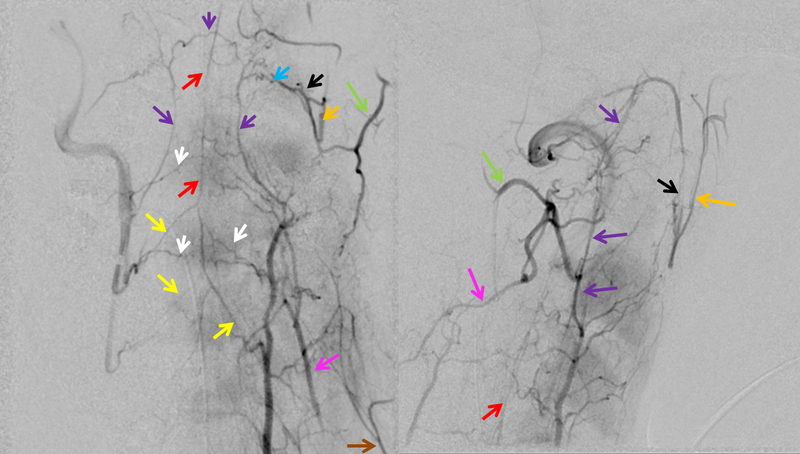 Vertebral artery supply of the anterior spinal artery, also known in this region as the artery of the cervical enlargement (yellow), via muliple radiculomedullary arteries (red). 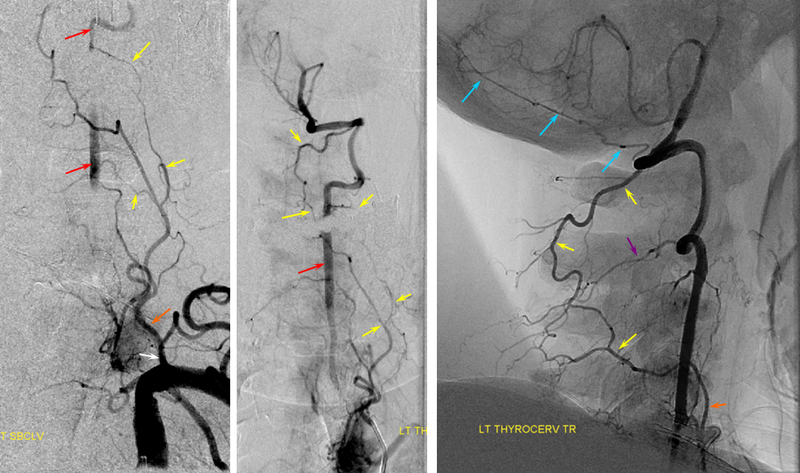 Also notice presence of lateral spinal pial system (purple) also supplied by same radiculomedullary vessels. 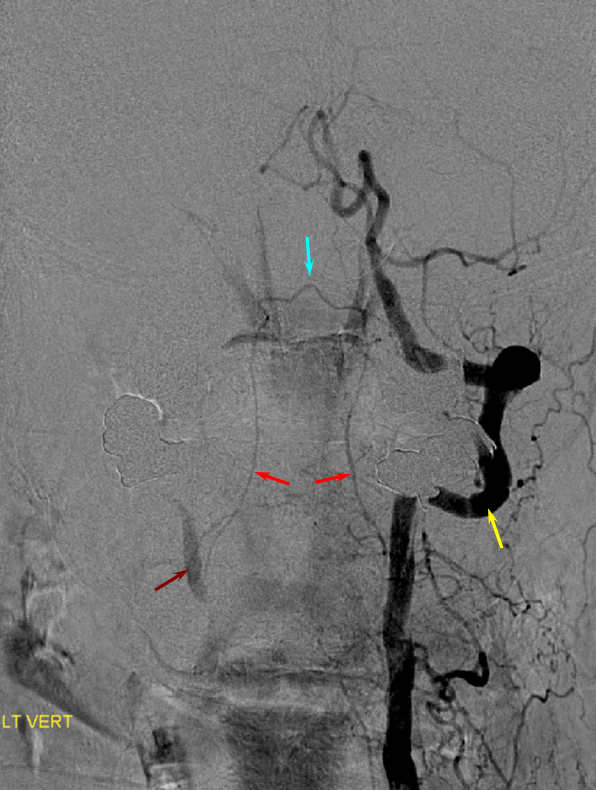 A barely perceptible right radicular artery (blue) emerges from this system at the C4/5 level, where radicular supply from the vertebral artery is hypoplastic. Extradural (C1) origin of PICA — another example. 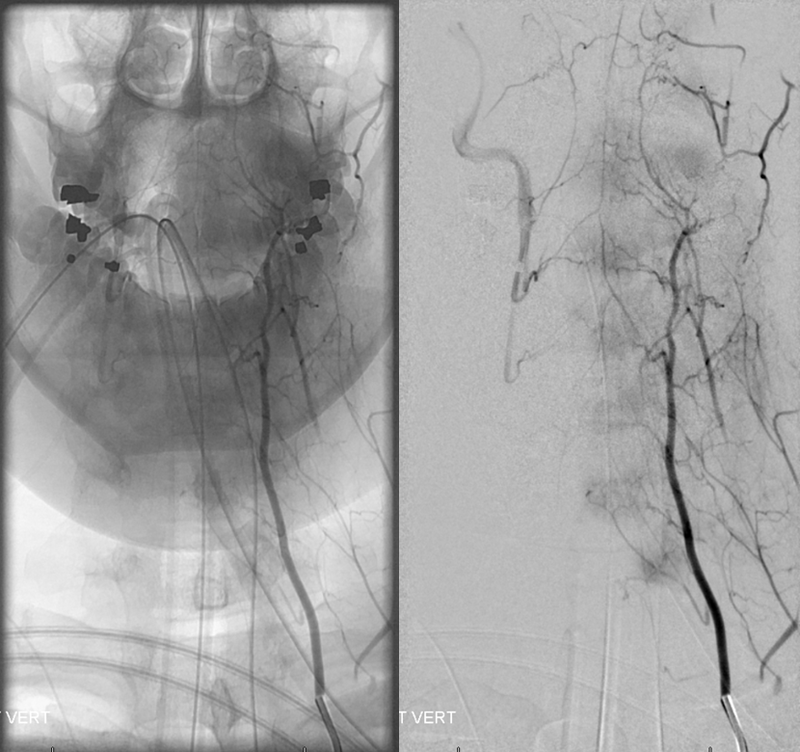 Persistent Hypoglossal Artery — this is not, technically speaking, a variation of the vertebral artery. 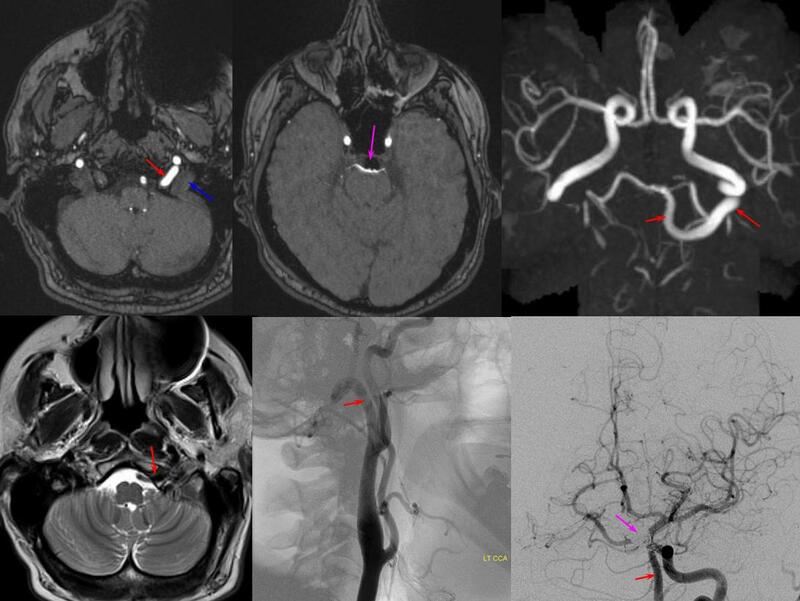 Rather, persistent hypoglossal artery represents developmental hypoplasia of the vertebral artery, whereby its role its fulfilled by the hypoglossal branch of the neuromeningeal trunk of the ascending pharyngeal artery. In other words, peristent hypoglossal artery is an ascending pharyngeal to basilar atery anastomosis, and the vert is hypoplastic. An embryonic carotido-vertebral anastomosis, the proatlantal artery is, in fact, the occipital artery. 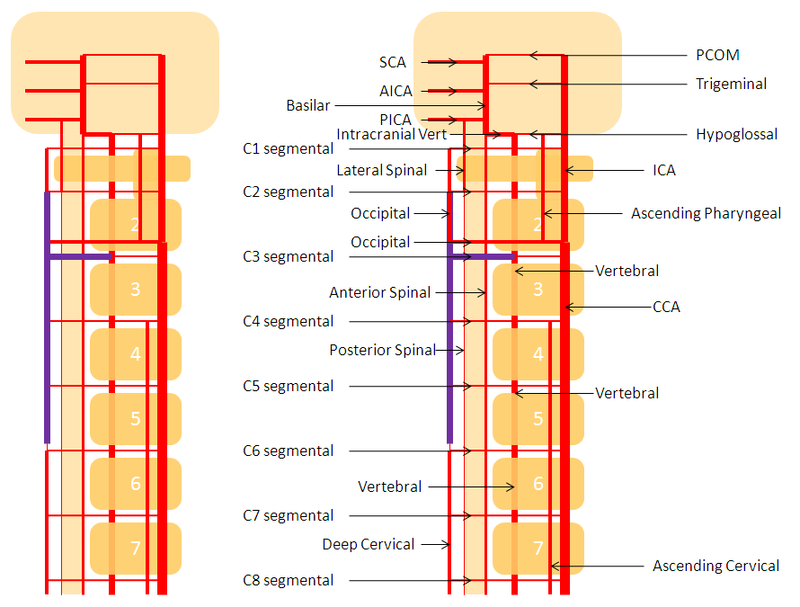 A C1 segmental connection between the occipital and vert is the Proatlantal type I; C2 level connection is Proatlantal type II (a different classification based on whether the proatlantal comes off the ECA or ICA exists also, to generate confusion, — embryologically, the classification according to cervical level of occipital-vertebral anastomosis makes more sense.) 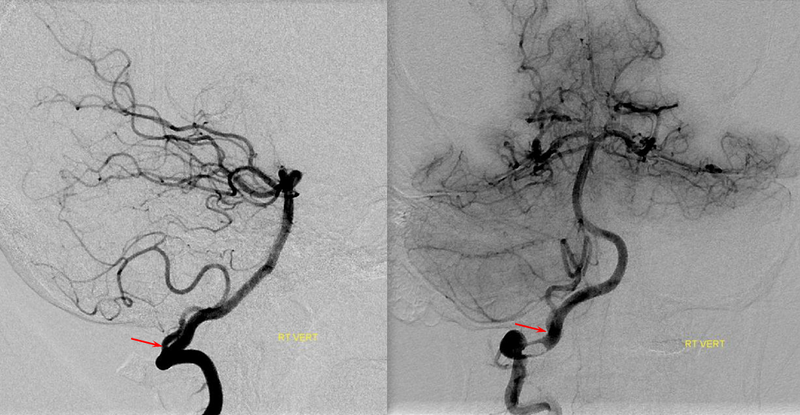 Usually, the vertebral artery proximal to the proatlantal segment is hypoplastic. 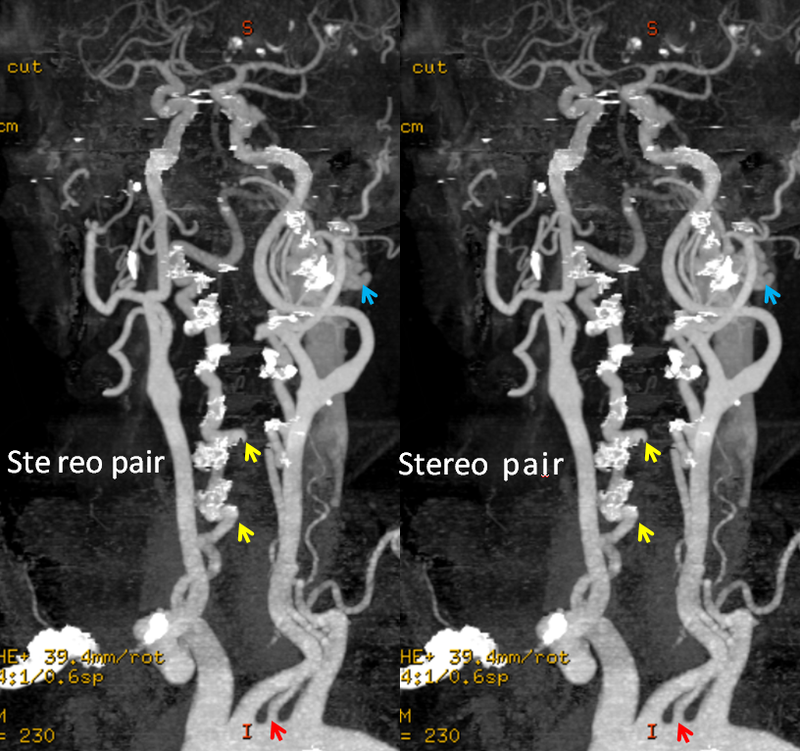 Stereo AP and Lateral views of left ECA injection, opacifying the vertebrobasilar system(yellow) via the C1 segmental artery (purple) connection to the occipital artery (red). This is the Proatlantal I type; the proximal occipital artery (red) is the proatlantal. Occipital artery distal to the vertebral anastomosis is blue, and IMAX is black. How to make a proatlantal artery? Answer: Get a vertebral fistula, and keep it for several years. Remember that proatlantal artery (I or II) is simply an occipital artery which, via the first (type 1) or second (type 2) segmental artery, is connected to the vertebral artery (in setting of vertebral hypoplasia proximal to the segmental artery in question). So, in effect, we all have small proatlantals. There are several ways to make one larger — one is to occlude the proximal vertebral artery (with no effective contralateral vertebral), or (much less often) increase demand on the ipsilateral vert. 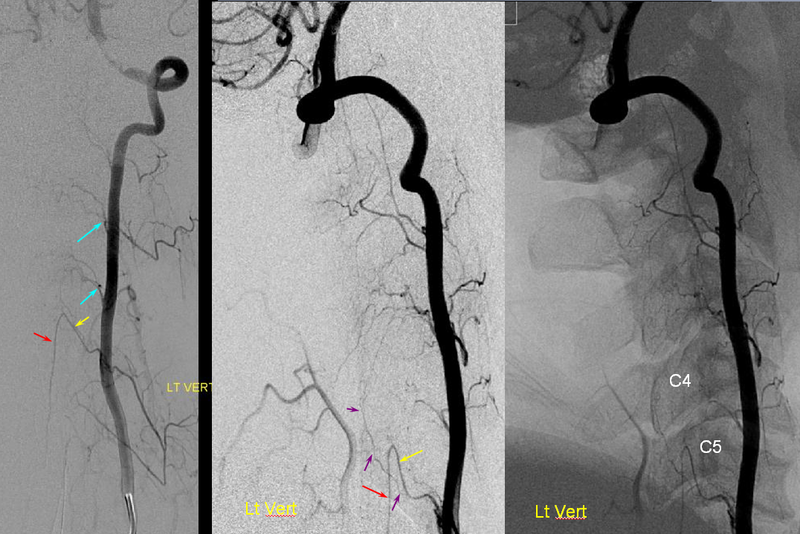 Embolization of the fistula has been carried out, with coils in the vert (black). 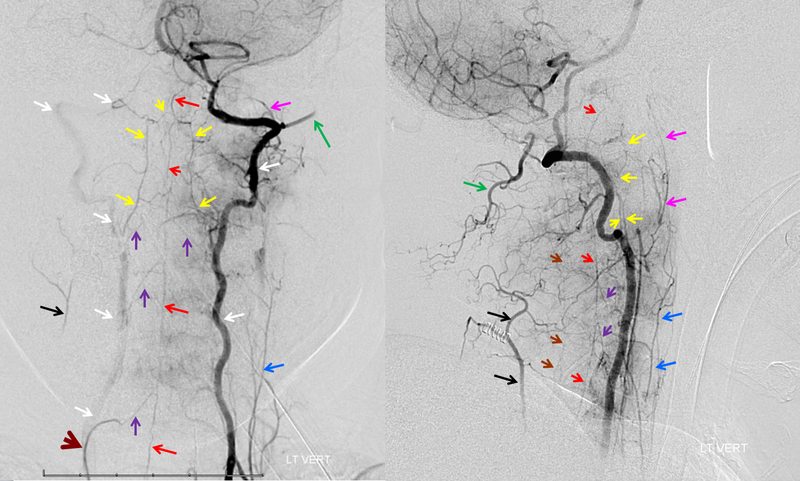 The occipital (red), via the first segmental artery (yellow), now opacifies the vertebral (green) in antegrade fashion, a la Proatlantal I artery. The lateral spinal artery is an important cervical intradural vessel which is homologous with the lateral medullary segmetn of the PICA in the brain and with the posterior spinal arteries in the thoracic and lumbar regions. Understanding this vessel allows one to make sense of the many variants encountered at the craniocervical junction. For example, the intradural C1 origin PICA is a lateral spinal artery segment (see PICA). In this case of apparent vertebral fenestration at the C1 (atlas) level, one should note that the larger, and more inferomedial vessel (pink and brown arrows) traverses the cervical dura via its descending segment (brown), and ascends cranially in the intradural position (pink). The ascending (pink) part of this vessel is the lateral spinal artery, the descending one (brown)is the segmental artery. 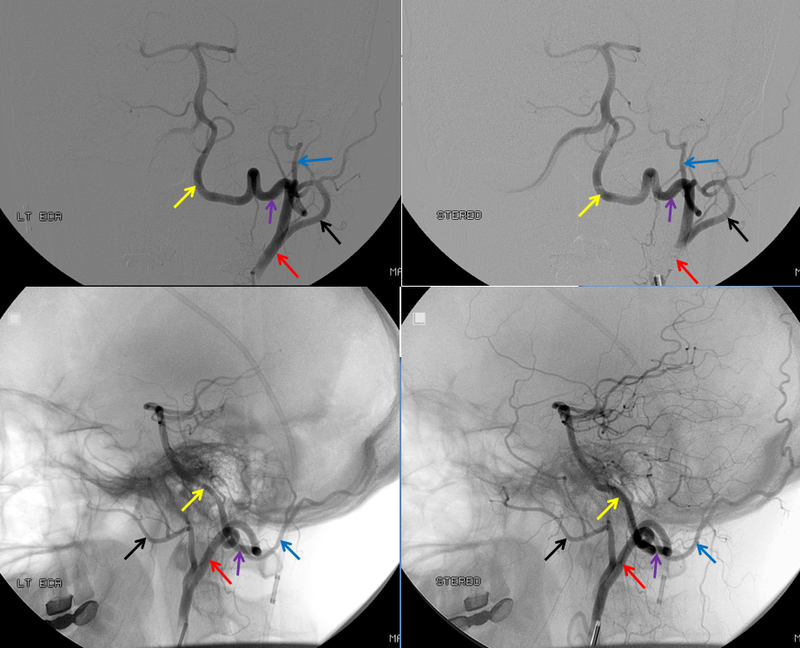 The smaller and more lateral vessel (blue arrows) is the “true” vertebral artery, which becomes intradural at its normally expected level. Consistent with the lateral spinal-PICA homology, the PICA (yellow arrow) “originates” from the lateral spinal artery (pink). 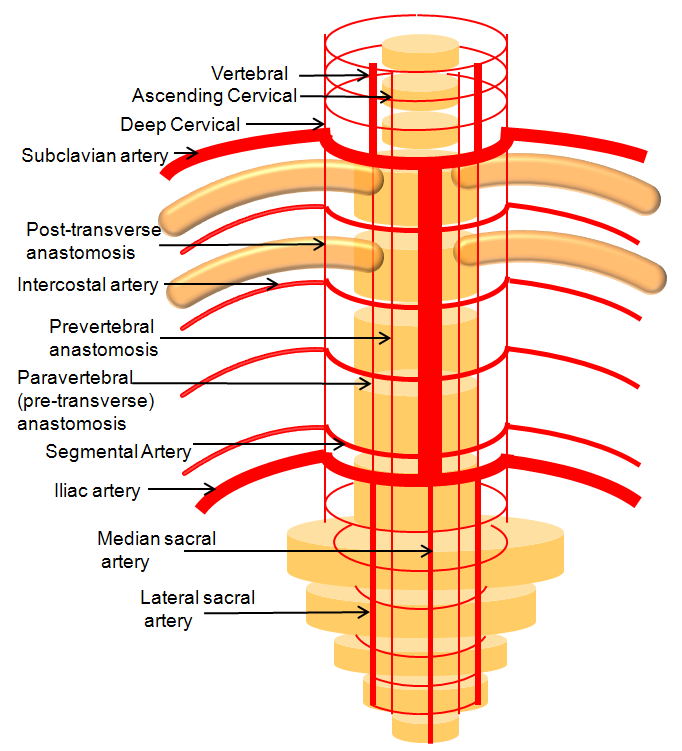 Sometimes, the “true” vert is missing entirely, and what one sees is a “vert” that becomes intradural at C1 — which is the lateral spinal artery acting like a vert, as in the diagram below. 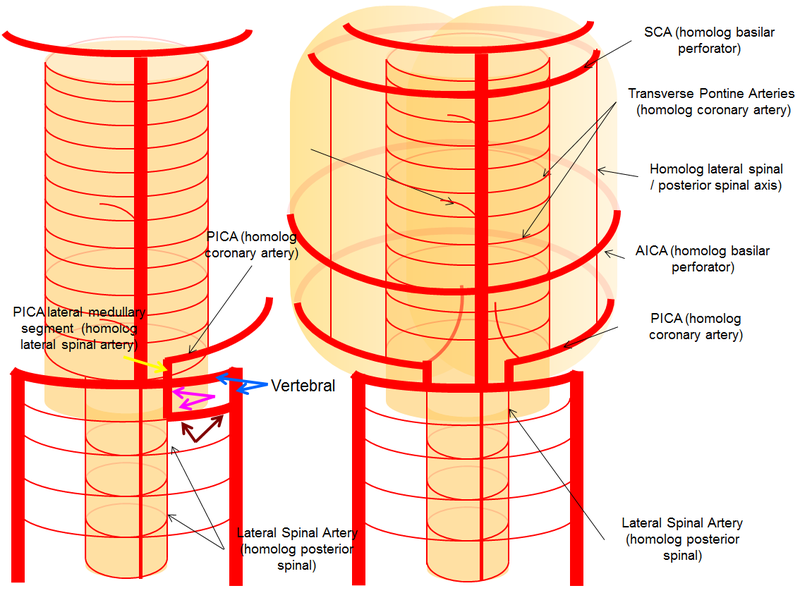 Lateral spinal artery is a pathway by which PICA can be reconstituted in cases of more proximal vertebral occlusion — again recognizing that PICA is a lateral spinal artery homolog — in effect an enlarged lateral spinal artery capturing territory of the cerebellum in addition to the lateral medulla. In this patient, the right vertebral artery is occluded just below the foramen magnum due to dissection. 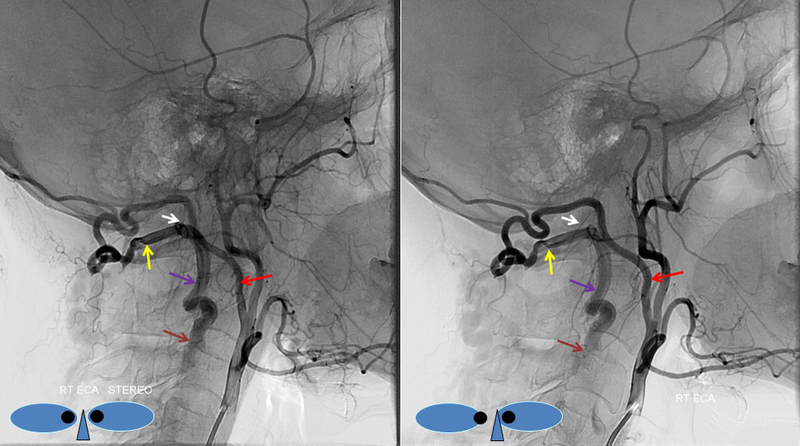 The C1 radiculopial artery (purple) connection to the lateral spinal artery (red) allows for reconstitution of the vermian branch of the PICA (black). The lateral spinal artery below the C1 radiculopial branch is marked with the pink arrow. Notice also presence of the anterior spinal artery (yellow) perfectly contrasting its anterior and medial position to that of the spinal artery. The C1 radicular branch (purple) is in effect the radiculopial artery is acting as a radiculopial artery, homologous to radiculopial supply of the posterior spinal arteries at the thoracic and lumbar levels (see Spinal Arterial Anatomy) The C1 muscular branch (green) opacifies the occipital artery (white) and deep cervical artery (blue).